"Fixie" Farr fixes things. After a personal failure, she has gone back to live at home and work in the family houseware store, Farrs, where her older siblings, Jake and Nicole, make sporadic appearances. When Ryan Chalker, Fixie's long-time crush flies in from LA, Fixie needs to calm down, and hops in her favorite caf�, where she saves her tablemate's laptop from certain annihilation. Sebastian Marlowe, the grateful customer, gives Fixie a blank IOU. When Fixie uses it, she comes to realize what her late father's motto "Family First" really means. 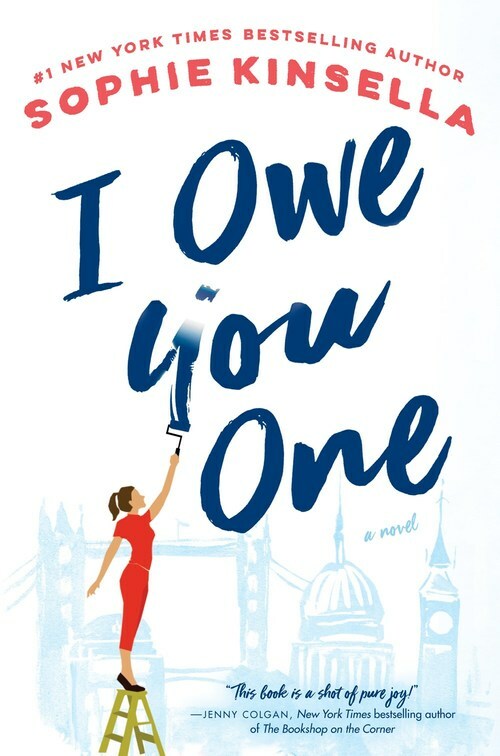 Sophie Kinsella's unparalleled talent at creating multidimensional and engaging characters has reached new heights in the extraordinary I OWE YOU ONE. I don't recall experiencing such strong visceral reactions to fictional beings ever before. I wanted to be Fixie's friend, comfort her, help her not because I pitied her, but because she was selling herself short and she deserved better. Some people might view Fixie as weak; I didn't; however she did let her brother intimidate her, she unwittingly encouraged her sister's weaknesses but felt powerless to do otherwise because family came first. Sometimes it's difficult to deem what's the best course of action for oneself, for others; we've all been there. I was outraged, incensed, and oh how I wanted to slap Jake, the pretentious, condescending snob! How I wanted to shake Nicole, the beautiful sister with her head in the clouds. I won't say anything about Ryan or Sebastian; you be the judge. Gripping is a word I seldom associate with Women's Fiction -- at least, not as far as I'm concerned -- but I OWE YOU ONE is just that -- because of the exceptionally well-crafted characters, and Sophie Kinsella's ability to never repeat herself. The author's writing is flawless, as always; the story progresses at lightning speed; I was overwhelmed with emotions as I had accompanied Fixie on her journey, hoping that everything would work out for her in the end. Few authors can do that for me, and none as well as Sophie Kinsella. From #1 New York Times bestselling author Sophie Kinsella comes an irresistible story of love and empowerment about a young woman with a complicated family, a handsome man who might be �the one,� and an IOU that changes everything. Fixie Farr has always lived by her father�s motto: �Family first.� And since her dad passed away, leaving his charming housewares store in the hands of his wife and children, Fixie spends all her time picking up the slack from her siblings instead of striking out on her own. The way Fixie sees it, if she doesn�t take care of her father�s legacy, who will? It�s simply not in Fixie�s nature to say no to people. So when a handsome stranger in a coffee shop asks her to watch his laptop for a moment, she not only agrees�she ends up saving it from certain disaster. To thank Fixie for her quick thinking, the computer�s owner, Sebastian, an investment manager, scribbles an IOU on a coffee sleeve and attaches his business card. Fixie laughs it off�she�d never actually claim an IOU from a stranger. Would she? But then Fixie�s childhood crush, Ryan, comes back into her life, and his lack of a profession pushes all of Fixie�s buttons. As always, she wants nothing for herself�but she�d love Seb to give Ryan a job. No sooner has Seb agreed than the tables are turned once more and a new series of IOUs between Seb and Fixie�from small favors to life-changing moments�ensues. Soon Fixie, Ms. Fixit for everyone else, is torn between her family and the life she really wants. Does she have the courage to take a stand? Will she finally grab the life, and love, she really wants? The trouble with me is, I can't let things go. They bug me. I see problems and I want to fix them, right here, right now. My nickname isn't Fixie for nothing. I mean, this can be a good thing. For example, at my best friend Hannah's wedding, I got to the reception and instantly saw that only half the tables had flowers. I ran around sorting it before the rest of the guests arrived, and in her speech, Hannah thanked me for dealing with "Flowergate." So that was OK.
On the other hand, there was the time I brushed a piece of fluff off the leg of a woman sitting next to me by the pool at a spa day. I was just trying to be helpful. Only it turned out it wasn't a piece of fluff; it was a pubic hair growing halfway down her thigh. And then I made things worse by saying, "Sorry! I thought that was a piece of fluff," and she went kind of purple, and two nearby women turned to look�. I shouldn't have said anything. I see that now. Anyway. So this is my quirk. This is my flaw. Things bug me. And right now the thing that's bugging me is a Coke can. It's been left on the top shelf of the leisure section of our shop, in front of a chessboard propped up for display. Not only that, the chessboard is covered with a brown stain. Obviously someone's opened the can or dumped it down too hard and it's splattered everywhere and they haven't cleared it up. Who? As I look around the shop with narrowed eyes, I fully suspect Greg, our senior assistant. Greg drinks some kind of beverage all day long. If he's not clutching a can, it's noxious filter coffee in an insulated cup decorated with camouflage and webbing, as though he's in the army, not working in a household store in Acton. He's always leaving it about the place, or even thrusting it at customers and saying, "Hold this a mo," while he gets a saucepan down off the display for them. I've told him not to. Anyway. Not the time for recriminations. Whoever dumped that Coke can (Greg, definitely Greg), it's caused a nasty stain, just when our important visitors are about to arrive. And, yes, I know it's on a high shelf. I know it's not obvious. I know most people would shrug it off. They'd say: "It's not a big deal. Let's get some perspective." I've never been great at perspective. I'm trying hard not to look at it but to focus instead on the rest of the shop, which looks gleamingly clean. A little shambolic, maybe, but then, that's the style of our all- purpose family shop. (Family-owned since 1985, it says on our window.) We stock a lot of different items, from knives to aprons to candlesticks, and they all need to go somewhere. I suddenly catch sight of an old man in a mac in the kitchen section. He's reaching with a shaking hand for a plain white mug, and I hurry over to get it for him. "Here you are," I say with a friendly smile. "I can take that to the till for you. Do you need any more mugs? Or can I help you with anything else?" "No, thank you, love," he says in a quavering voice. "I only need the one mug." "Is white your favorite color?" I gently press, because there's something so poignant about buying one plain white mug that I can't bear it. "Well." His gaze roams doubtfully over the display. "I do like a brown mug." "This one maybe?" I retrieve a brown earthenware mug that he probably discounted because it was too far out of reach. It's solid, with a nice big handle. It looks like a cozy fireside mug. The man's eyes light up, and I think, I knew it. When your life is restricted, something like a mug choice becomes huge. "It's a pound more expensive," I tell him. "It's �4.99. Is that OK?" "That's fine, love." He smiles back. "That's fine." "Great! Well, come this way�." I lead him carefully down the narrow aisle, keeping my eyes fixed on danger points. Which isn't quite the selfless gesture it might seem�this man is a knocker-overer. You can tell as soon as you lay eyes on him. Trembling hands, uncertain gaze, shabby old trolley that he's pulling behind him�all the signs of a classic knocker-overer. And the last thing I need is a floor full of smashed crockery. Not with Jake's visitors arriving any moment. I smile brightly at the man, hiding my innermost thoughts, although the very word Jake passing through my brain has made my stomach clench with nerves. It always happens. I think Jake and my stomach clenches. I'm used to it by now, although I don't know if it's normal. I don't know how other people feel about their siblings. My best friend, Hannah, hasn't got any, and it's not the kind of question you ask random people, is it? "How do your siblings make you feel? Kind of gnawed-up and anxious and wary?" But that's definitely how my brother, Jake, makes me feel. Nicole doesn't make me feel anxious, but she does make me feel gnawed-up and, quite often, like hitting something. Maybe it's because both of them are older than me and were tough acts to follow. When I started at secondary school, aged eleven, Jake was sixteen and the star of the football team. Nicole was fifteen, stunningly beautiful, and had been scouted as a model. Everyone in the school wanted to be her friend. People would say to me, in awed tones, "Is Jake Farr your brother? Is Nicole Farr your sister?" Nicole was as drifty and vague then as she is now, but Jake dominated everything. He was focused. Bright-eyed. Quick to anger. I'll always remember the time he got in a row with Mum and went and kicked a can around the street outside, shouting swear words into the night sky. I watched him from an upstairs window, gripped and a bit terrified. I'm twenty- seven now, but you never really leave your inner eleven- year-old, do you? Which I will not think about now. Instead, I smile at the old man, trying to make him feel that I have all the time in the world. Like Dad would have done. "Fifty�" I hear him saying as he peers at a coin. "Is that a fifty-pence piece?" "Let's have a look, love," says Morag in her reassuring way. Morag's been with us for seven years. She was a customer first and applied when she saw an ad pinned up on a noticeboard. Now she's assistant manager and does all the buying for greeting cards�she has a brilliant eye. "No, that's a ten-pence," she says kindly to the old man. "Have you got another pound coin in there?" My eyes swivel up to the Coke can and stained chessboard again. It doesn't matter, I tell myself. There isn't time to sort it now. And the visitors won't notice it. They're coming to show us their range of olive oils, not inspect the place. Just ignore it, Fixie. Oh God, but I can't. It's driving me nuts. My eye keeps flicking upward to it. My fingers are doing that thing they do whenever I'm desperate to fix something, when some situation or other is driving me mad. They drum each other feverishly. And my feet do a weird stepping motion: forward-across-back, forward-across-back. I've been like this since I was a little kid. It's bigger than me. I know it would be mad to drag a ladder out, get a bucket and water, and clean the stain up, when the visitors might arrive at any moment. I know this. "Greg!" As he appears from behind the glassware section, my voice shoots out before I can stop it. "Quick! Get a stepladder. I need to clean up that stain." Greg looks up to where I'm pointing and gives a guilty jump as he sees the Coke can. "That wasn't me," he says at once. "It definitely wasn't me." Then he pauses before adding, "I mean, if it was, I didn't notice." The thing about Greg is, he's very loyal to the shop and he works really long hours, so I forgive him quite a lot. "Doesn't matter who it was," I say briskly. "Let's just get rid of it." "OK," Greg says, as though digesting this. "Yeah. But aren't those people about to arrive?" "Yes, which is why we need to be quick. We need to hurry." "OK," says Greg again, not moving a muscle. "Yeah. Got you. Where's Jake?" This is a very good question. Jake is the one who met these olive-oil people in the first place. In a bar, apparently. He's the one who set up this meeting. And here he isn't. "He's always landing you in it, Jake is," Greg mutters. "You never know when he's going to turn up. Can't rely on him. We're short-staffed today too, what with your mum taking the day off." All of this might be true, but I can hear Dad's voice in my head again: Family first, Fixie. Protect the family in public. Have it out with them later, in private. "Jake does his own hours," I remind Greg. "It's all agreed." All of us Farrs work in the shop�Mum, me, Jake, and Nicole� but only Mum and I are full-time. Jake calls himself our "consultant." He has another business of his own and he's doing an MBA online, and he pops in when he can. And Nicole is doing a yoga-instructor course Monday to Friday, so she can only come in at weekends. Which she does sometimes. "I expect he's on his way," I add briskly. "Anyway, we've just got to deal with it. Come on! Ladder!" As Greg drags a stepladder across the shop floor, I hurry to our back room and run some hot water into a bucket. I just need to dash up the ladder, wipe the stain away, grab the can, jump down, and clear everything before the visitors arrive. Easy. The leisure section is a bit incongruous, surrounded as it is by tea towels and jam-making kits. But it was Dad who set it up that way, so we've never changed it. Dad loved a good board game. He always said board games are as essential to a household as spoons. Customers would come in for a kettle and leave with Monopoly too. And ever since he died, nine years ago now, we've tried to keep the shop just as he created it. We still sell licorice allsorts. We still have a tiny hardware section. And we still stock the leisure section with games, balls, and water guns. The thing about Dad was, he could sell anything to anyone. He was a charmer. But not a flashy, dishonest charmer; a genuine charmer. He believed in every product he sold. He wanted to make people happy. He did make people happy. He created a community in this little corner of West London (he called himself an "immigrant," being East End born), and it's still going. Even if the customers who really knew Dad are fewer every year. "OK," I say, hurrying out to the shop floor with the bucket. "This won't take a sec." "They're here," announces Greg. "There's a car pulling into the parking space." It was Jake who insisted we reserve our only parking spot for these olive-oil people. They'll have asked, "Do you have parking?" and he won't have wanted to say, "Only one space," because he's pretentious that way, so he'll have said airily, "Of course!" as though we've got an underground vault. "No problem," I say breathlessly. "I'm done. All good." I hear Greg's voice below, but he's always regaling us with stupid health-and-safety rules he's read online, so I don't alter my step or my pace until he shouts, "Stop!" sounding genuinely alarmed. "Fixie!" Stacey yells from the till. She's another of our sales assistants and you can't miss her piercing nasal voice. "Look out!" I lift my spare hand to protect myself from a deluge of little rubber balls. They're bouncing on my head, my shoulders, all over the shop. How come we have so many of the bloody things, anyway? As I reach the bottom of the ladder, I look around in horror. It's a miracle that nothing's been smashed. Even so, the floor is a carpet of bouncy balls. "Quick!" I instruct Greg and Stacey. "Teamwork! Pick them up! I'll go and head off the visitors." As I hurry toward the door, Greg and Stacey don't look anything like a team�in fact, they look like an anti-team. They keep bumping into each other and cursing. Greg is hastily stuffing balls down his shirtfront and in his trouser pockets and I yell, "Put them back in the tub!" "I didn't even notice that Coke stain," volunteers Stacey as I pass, with one of her shrugs. "You should have left it." "Is that helpful?" I want to retort. But I don't. For a start, Stacey's a good worker and worth keeping on side. You just have to deal with what Mum and I call the SIMs (Stacey's Inappropriate Moments). But of course the real reason I say nothing is that she's right. I should have left it. I just can't help fixing things. It's my flaw. It's who I am.